I awoke on Day 6. It’s Tuesday. I’m starting to rely on this blog to keep track of what I’ve done and what day it is, as it’s all starting to blur together. I made some coffee and checked email. A local guy in a Suburu, still dripping in his wetsuit with a board in his car stopped alongside the bus. I thought he was just going to say hi, as everybody I’ve met on the road so far has been friendly and encouraging. But, this guy just wanted to hassle me for parking “on private property.” I informed him I was well outside the gate that was marked “private property,” and that he should move the sign if I was a problem. He wasn’t too happy with my response, so I told him I’d be moving on soon nonetheless. Whatever. As I packed up, I realized that while I slept somebody had stolen my camp shower and collapsible water jug (which was clearly “private property.”) I guess that was their idea of an eye for an eye. I hope they get as much enjoyment out of it as I did. I went onto Amazon and ordered a new one to be delivered to my friends Greg and Amy’s house in Pacifica, where I’d be spending the next couple of days surfing with Greg’s crew of Ocean Beach hellmen. But first, breakfast. As I’d clearly overstayed my welcome, I decided to grab some grub in Davenport. I pulled into the Davenport Roadhouse and ordered their Zucchini and Potato Latkes with eggs. One of the most original and tasty breakfasts I’ve ever had—and their coffee was excellent. Davenport has some cool stuff, but don’t blink or you’ll blow right through. The bakery there is legendary, and Slow Coast might be the most awesome coffee shop in California. 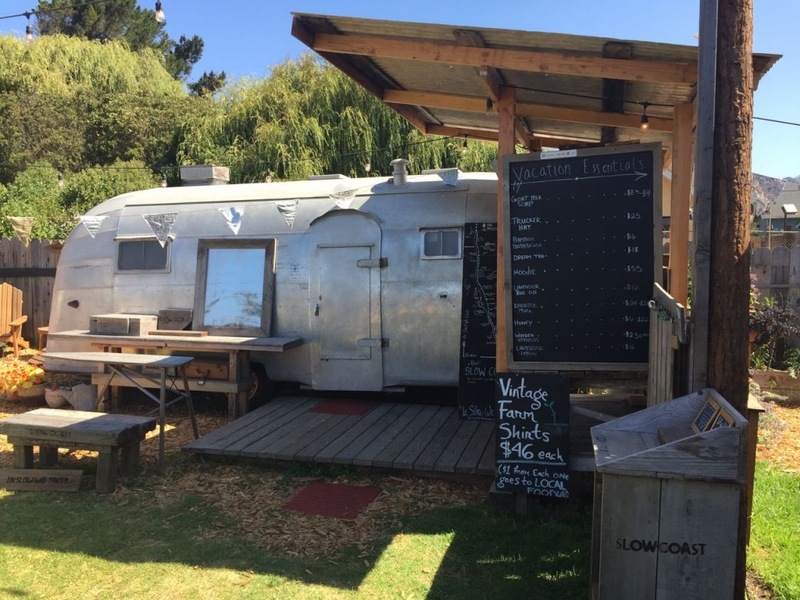 In an old Airstream, they have local, organic gifts, and award winning coffee, bread, and goat cheese. There’s also a tasting room for the Bonnie Doon winery. You could really spend a fun day here; breakfast, lunch, and dinner. Davenport Landing is known as one of the coldest and sharkiest surf spots on the central California coast. I paddled out where a couple of other guys were surfing the left, but had heard that the right just south was a bigger wave, and rarely surfed. It was sunny, which took some of the sting out of the cold water and wind. The northwest wind kept blowing me south and out of the lineup for the right, which was pretty inconsistent. Every time one would roll through, I would paddle back up to where it was breaking but by the time I got lined up, the set was done. After about 45 minutes of this futility, I decided to sit outside and catch some of the bigger lefts. They were fast and fun. This was by far the best surf I’d had on the trip so far, but probably only a “five” on a 10-scale. I hadn’t done the drive north through Half Moon Bay into Pacifica since they finished the Devil’s Slide tunnels. While I was anxious to get into Pacifica, I kept being lured by roadside signs. If there are two things I struggle to resist, it’s pie and breweries. And I couldn’t show up to a friend’s house empty handed. As I hit the Pigeon Point Lighthouse, I knew I was getting close. They did a fantastic job on the tunnels. The old pass was a nightmare of hairpins, cyclists, rockslides and glare. Now it’s just smooth sailing and opening up the cool towns from Montara to Half Moon Bay. I hit Pacifica and hooked up with Greg Gubser, and his dogs. Duke is the biggest dog I’ve ever known. He’s a Newfoundland, who was trained as a diabetes alert dog for his son, Justin. Justin and my son Devin went to middle school together. They were paired up because they were both diabetics. It was funny watching them together, as Devin was small for his age, and Justin was huge. Mutt and Jeff. Justin is just as big as his dog. They’re both gentle giants, though. Justin plays catcher and plays first base for the Purdue Boilermakers. Greg and I took the dogs along the water for a walk. The views from the trail were spectacular. We watched half a dozen whales spouting off the coast as the sun set. It was really good to be back in Pacifica. After the walk we drove back down to Half Moon Bay for one of the treats that keeps me coming back here. 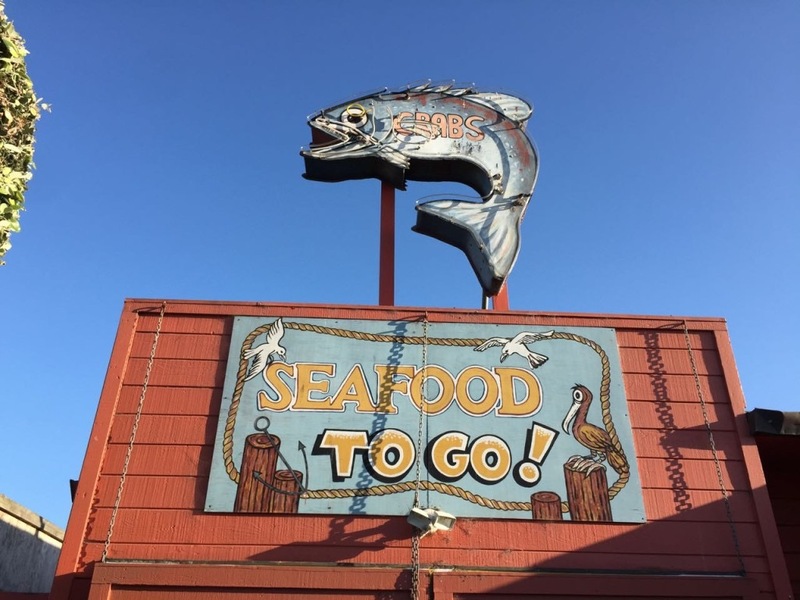 Barbara’s Fish Trap at Pillar Point Marina has the best fish and chips on the planet (sorry north London). With a giant bowl of chowder to share, I was in Atlantis. Before we headed back, Greg stopped into the Harbor Patrol office to chat with his buddy, Chris Chang. Greg is a harbormaster and used to be stationed here. Pillar Point is where Mavericks is. If you’re not familiar with it, click the link. Chris is a super cool guy, a great surfer, and fisherman. It’s good to have guys like him on patrol at such a monster break. Tomorrow, I need to get the bus looked at. I definitely developed an exhaust leak somewhere in Big Sur. She’s not quite right and I want to have her checked out before I tackle the Lost Coast this weekend.